Remember how I got myself a gift for my knitaversary? Ta-da! It is now socks. For my grandma ;). Pattern: Sunday Swing by Kristel Nyberg, from the Summer 2009 issue of Knitty. I had really fancy plans for this skein of yarn – cables and lace and all kinds of complicated patterning! But the colorway proved to be more variegated than I initially anticipated, and this is pretty much as intricate as it would allow itself to be. Thanks to Abby for pointing me in the right direction – the Sunday Swing pattern was perfect! Yarn: Fleece Artist Trail Socks merino/nylon blend (from Tidal Brook Yarns ); Peridot colorway, 1 skein. I made only three modifications to the pattern, two immediately evident in the photo above. First, I knit 2 X 2 ribbing instead of 1 X 1. That’s a standard change for me, I never like the way 1 X 1 ribbing looks. Second, I knit the second sock as the reverse-image of the first by simply reflecting the charts in my head (alternatively, you can look at them in the mirror). You can’t see the third modification in the photo, but you’d be able to feel it if you put on the socks: I included a teeny bit of calf shaping. I simply cast-on 72 sts, then omitted some of the yarn-overs while I knit the leg, ending up with 64 sts for the heel and foot portions. Trail Socks was a wonderful yarn to work with, but I didn’t find it as cooperative as Lorna’s Laces: it was spun a bit on the fluffy side and was therefore somewhat splitty. But the colors, oh, the colors! It was a joy to see each stitch emerge. When I visited my grandma last week, one of the socks was done and she pulled it on – a perfect fit! I think I know by feel alone how much bigger her feet are than mine, and how loose the socks have to be on my feet in order to fit hers. I also had the opportunity to inspect some of her current sock collection. It’s not something she usually lets me do because “each pair is perfect and her favorite.” She doesn’t like to show me which socks are falling apart, which don’t fit particularly well. On this rare occasion I observed that pretty much all socks, old and new, wear out exceptionally quickly on her heels… not the back of the heel, but the part where we usually “turn the heel.” So, I’m thinking of weaving in some reinforcement thread, like I did once before, into that area. I wish she’d let me know if this helps, if it will make the socks last longer than others, but I know it won’t happen. But if she lets anything slip, I’ll let you know :). These little socks are beautiful! Your grandma is going to be very happy! oh, I love how this colorway knit up! The socks are amazing! I agree about the colors perfect for the socks. About those size 0 needles. I knit so slowly that I haven’t even considered a pattern on anything smaller than a size 2 needle. If I ever figure out gauges and yarn and needle sizes I may go even larger. Beautiful socks. If only I didn’t have to wait till I finished my Christmas knitting before Sunday Swing for myself. Ah well, it’ll be nice to look forward too. .. great socks and I love the color.. They look wonderful mirrored. I really like them in the soft peridot tones too. Your version makes me want to knit them more than any other that I’ve seen. Lovely socks! That pattern is in my sock que. It’s really nice for colorful skeins. You must really love your grandmother, keeping her in socks and knitting that lovely cranberry shawl. Is she making good use of it? Variegated yarn can be so difficult, but this is a great pattern for it. Absolutely gorgeous, thanks for sharing your mods. Your socks look great! And thanks for the hint on calf shaping. My calves are on the shapely side, so I will have to try out your idea. I’m dying to try this pattern. I think it’s perfect for variegated yarns. Looks great, as always! I love this sock pattern. It has enough in it to keep you busy with a yarn that doesn’t take to lace or cables and is simple enough that you can carry on a conversation while you need it. The yarn is gorgeous! Your grandma is going to love wearing them. 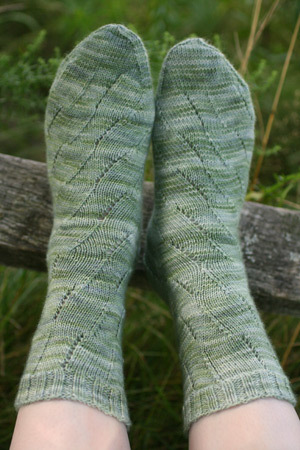 Your Sunday Swing socks turned out gorgeous! I’m working a pair in the same pattern, but I don’t like how they’re turning out. The yarn is orange and brown. Kind of blech colors. The socks are beautiful. You have a very lucky grandma. Those are really pretty. I love how you are a Grandma Sock detective. Hee! Great socks! Thanks for posting about these. I have some Hand Maiden sock yarn in the colorway “pewter” that I’ve been trying to decide what to do with. I think I’ll use your modifications of the Sunday Swing so I really appreciate the info! Great minds think alike–I just posted my own symmetrical Sunday Swings on Ravelry this week! I do like them better that way :-). These are amazing socks! I just cast on for the first one Monday morning, using Intention Yarns from Lime N Violet. Now, for the second one, I’ll try reversing the chart so they’re mirror images. Thanks for the great tip! what a lucky grandmother you have 🙂 i just finished a pair of socks for my grandmother – the first pair i’ve ever knit for her! What a blessed grandma you have! I just wanted to say that I love that you make socks for your Grandma. I bet she is so proud everytime she tells someone what you did for her. Thanks for warming my heart and pleasing the eyes! I couldn’t love these more! As soon as I saw them, I had to cast on for some socks myself. Thanks for the inspiration. The socks look great. They’re in my que to make, and they have been, since I saw the pattern. The yarn looks lovely in the pattern! Great combination of yarn and pattern! So simply pretty. I’ve heard varying results when using reinforcing thread with some saying that it actually increases wear because the fibers are rubbing against each other. What has your experience been? Perfect color! It’s so soothing. Gorgeous socks! I love how soothing this color is.